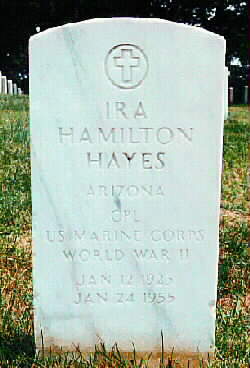 Ira Hayes was a Pima Indian who enlisted in the United States Marine Corps early in World War II. He gained fame in the Pacific campaign when he, along with four fellow Marines and one Sailor, raised the US flag over Iwo Jima while the battle still raged for that island fortress. The act of raising the flag was captured by AP photographer Joe Rosenthal and became the image on the biggest-selling American postage stamp of all time. One of Washington's premier landmarks is the world's largest statue, an immense sculpture in bronze, weighing 100 tons and reaching a height of 110 feet. It depicts six Marines--each figure about 32 feet tall--hoisting an American flag on the island of Iwo Jima, a part of the prefecture of Tokyo, located in the Pacific Ocean 650 miles from the Japanese mainland. The monument memorializes one of the final battles of the 20th century's Second World War and has become, in the words of an academician, "one of the most charged and powerful cultural symbols of patriotism to mainstream Americans." It was copied from a photograph made in February 1945 by Joe Rosenthal, an Associated Press photographer. The struggle ended a month or so later with more than 25,000 American Marines dead or wounded. The Japanese garrison of 22,000 was annihilated but for a few prisoners. The flag-raising image, captured by Rosenthal in 1/400th of a second, had an adrenaline effect on a public tiring of war and haunted by fear that the approaching invasion of Japan would be Armageddon. Critics hailed the picture as a transcendent work of art. It inspired the sale of billions of dollars in war bonds and gave sculptor Felix de Weldon the blueprint for the huge statue that now looms alongside the Arlington National Cemetery. It made Rosenthal famous, brought sculptor de Weldon both fame and wealth, and gave the Marines a semi-religious institutional icon, a triumphant metaphor for the very soul of the Corps. What has been lost in all this is any collective memory of the six boys who raised the flag and then, after an instant of notoriety, passed into the void of anonymity that, with few exceptions, awaits us all. Who were they? What happened to them? 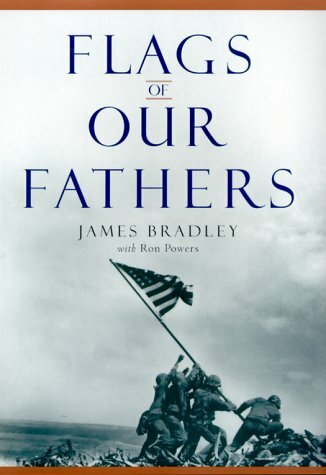 The most recent of the many books inspired by the battle and by Rosenthal's sublime image is Flags of Our Fathers, by James Bradley. It is described in a jacket blurb by the prolific military historian Stephen Ambrose as "the best battle book I have ever read." Others may view it in that light, but that was not the author's purpose. His principal aim was to rescue these forgotten boys--one of them his father--and transform them from "anonymous representative figures" into individuals. His profiles of them resemble a cast from the paintings of Norman Rockwell, unfamous, un-celebrified, "ordinary" Americans: --Mike Strank, an immigrant from Czechoslovakia, brought to America in infancy by his father, who had found work digging coal in Pennsylvania for Bethlehem Steel. 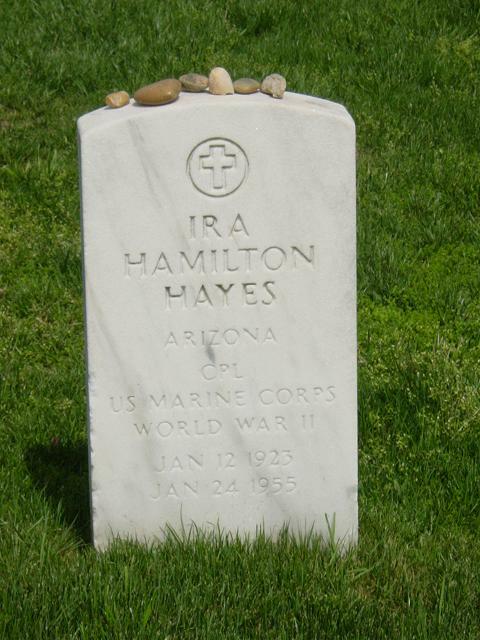 --Ira Hayes, a "non-citizen" and immigrant of sorts in his native land, a Pima Indian born on a small cotton farm in the Gila River reservation in Arizona--geography his people had occupied for more than 2,000 years. --Harlon Block, born on a farm in the Rio Grande valley of Texas, a superb athlete raised in a pacifist Seventh Day Adventist home where killing and even the possession of weapons were forsworn. "It is doubtful," Bradley writes, "that in his short life Harlon Block ever kissed a girl." --Franklin Runyon Sousley, a good old hillbilly boy from Eastern Kentucky, a practical joker who, it was said, would "fight a running sawmill." His father died when he was 8 years old, leaving him as the man in the family. --Rene Gagnon, child of French Canadian mill workers in Manchester, N.H., a shy, self-conscious "mama's boy" who "never chummed with the guys" and, like his parents, faced a lifetime in a factory until the Marines got him in 1943.
avoid combat, wound up as a medical corpsman with the Marines and came home with a Navy Cross, an honor unrevealed to his family until after his death. They were teenagers, Bradley writes, "scarcely out of boyhood when they enlisted. Their lives up till then had been kids' lives: hunting, fishing, paper routes, the movies, adventure programs on radio . . . first wary contacts with girls . . . Most of them were poor. The Great Depression ran through their lives." They grew up fast in the war, discovering that doing their duty to God and country involved unimagined pain, terrors and awful deeds. 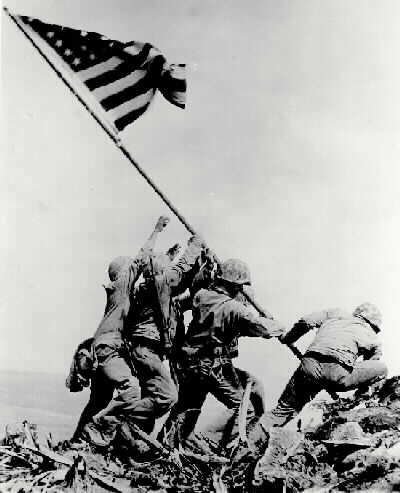 On Feb. 23, 1945, the fifth day of the battle, they raised the second of two flags planted that morning on the summit of Mount Suribachi, an extinct volcano that overlooked the landing beaches and had been made by the Japanese into a hellish nest of gun emplacements, pillboxes, fortified caves, tunnels and storage depots. A week later their outfit, Easy Company, Second Battalion, 28th Marines, joined an assault on another ugly, heavily fortified terrain. They came under heavy sniper fire. Mike Strank, now a sergeant, squad leader and father figure to Hayes, Block and Sousley, led them to cover under a rocky outcropping. A shell, almost certainly from an American destroyer lying offshore, exploded and tore out Strank's heart. Harlon Block took over the squad. A few hours later a mortar round sliced him from groin to neck. As his intestines poured out on the ground he cried out: "They killed me." Easy Company moved on, losing men daily. Jack Bradley, the corpsman, was wounded by shrapnel and flown out to a hospital in Guam. Sousley was shot by a sniper. Someone shouted: "How ya doin'?" Sousley replied: "Not bad. I don't feel anything." Then he fell and died. Ira Hayes left Iwo Jima unwounded and nine months later was a civilian again, leaving behind in a mass graveyard on the island the best friends he ever had--Mike and Harlon and Franklin. Back home he found menial jobs on the reservation--cotton picking and other day labor work. He became a drifter, drank a lot, was in and out of jail and died in an abandoned hut on the reservation after an all-night poker game in January 1955, just short of 10 years after the flag-raising. He was 32 and got the biggest funeral in the history of Arizona. Rene Gagnon survived the war unharmed, tried to exploit his brief fame as a flag-raiser but never "made it" out of the New Hampshire rut into which he was born. He was a janitor at a tourist home when he died in 1979 at the age of 54. Jack Bradley died in 1994, patriarch of a large family, revered town father in Antigo and proprietor of one of the largest funeral businesses in Wisconsin. None of their names is on the monument. You can find out more about them in James Bradley's fine book. Richard Harwood, a veteran of the Iwo Jima battle, is a former reporter, editor and columnist for The Washington Post. Following the war, unable to cope with his new-found fame, Ira Hayes turned to alcohol. Unable to keep a steady job, he was working as a cotton-picker on an Arizona Indian Reservation when he was found dead from alcohol and exposure on January 24, 1955. He now lies in Section 34 of Arlington National Cemetery.